2nd Annual US Border & National Security Summit is designed as an educational and training “Town Hall” forum, where thought leaders and key policy-makers across Homeland Security, Border Security, Intelligence Agencies, and law enforcement officials can come together for actionable discussions and debate. America shares 7,000 miles of land border with Canada and Mexico, as well as rivers, lakes and coastal waters around the country. Protecting these borders from the illegal movement of weapons, drugs, contraband, and people, while promoting lawful entry and exit, is essential to US National Security, public safety, economic prosperity, and development. DSI’s Border & National Security Summit advances goals to secure US borders through discussions on personnel, technology, and infrastructure; as well as working closely with Canadian and Mexican, federal, state, local, tribal, and territorial partners in a full spectrum event. 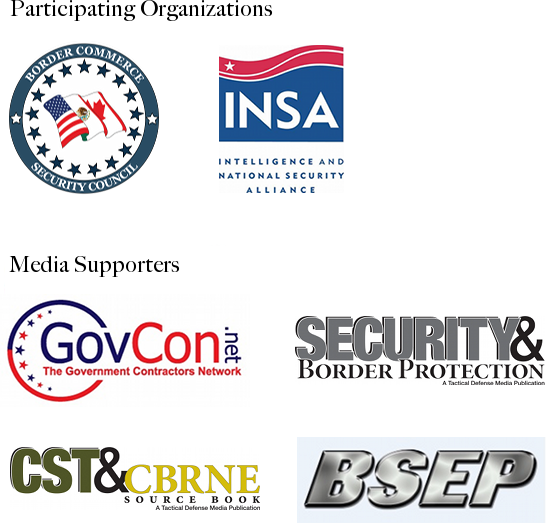 Exhibit & Sponsorship Opportunities: The US Border & National Security Summit provides opportunities in exhibit space, round table discussions, product demonstrations, to luncheon receptions for border security industry leaders to address technology offerings and today’s most innovative solutions. *The U.S. Border & National Security Summit is open to all DoD and Federal employees and is considered a compliant education and training forum.